Welcome to Point at Obstruction Pass! One of our finest properties displays the unique harmony between luxury and the wild beauty of the Islands. Don't look now, but you have finally arrived. Point at Obstruction Pass has its own small cove - only a couple steps from the main house. You can keep an eye on the kids while playing or move the family down for s'mores on the beach in the evening. An impressive deck looks out over the private cove. Walk along the beach out to the unique point that the home is named after. The main living room sitting area with large windows to take in the view. Because the home is out on a point the water views wrap around to the side of the house as well. A fireplace and TV nook off the main living room. A large kitchen island with bar height stools. The view from the kitchen of the open spacious main room. The dining room table off the kitchen. The downstairs kitchen enables second families to prepare food items as they need to without using the main kitchen. A second view of the master bedroom looking the other way. If this does not relax you nothing will. 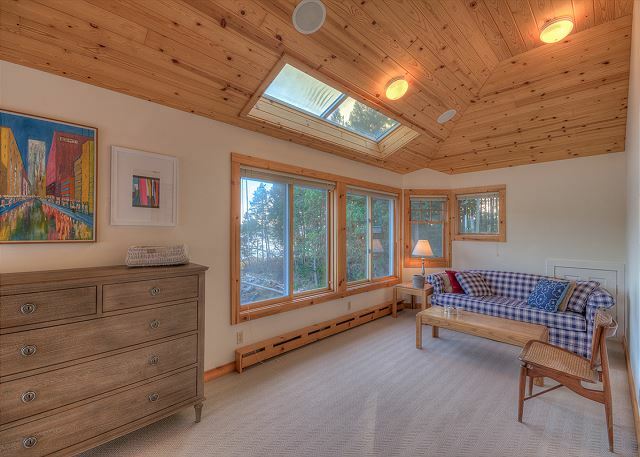 The spacious master bedroom is complete with a couch and coffee table. This bedroom offers two twin beds. A second view of the twin bed bedroom. 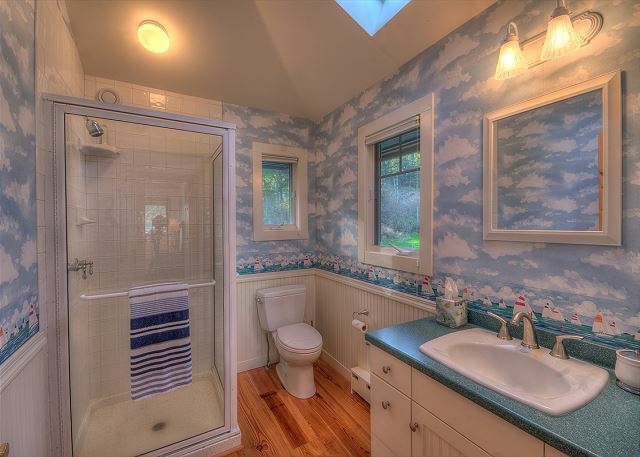 Have you ever showered in the clouds? The upstairs hall showing both the master and twin bed bedrooms. A large cozy king size bed. Walk out onto the deck and straight onto your own private cove beach. 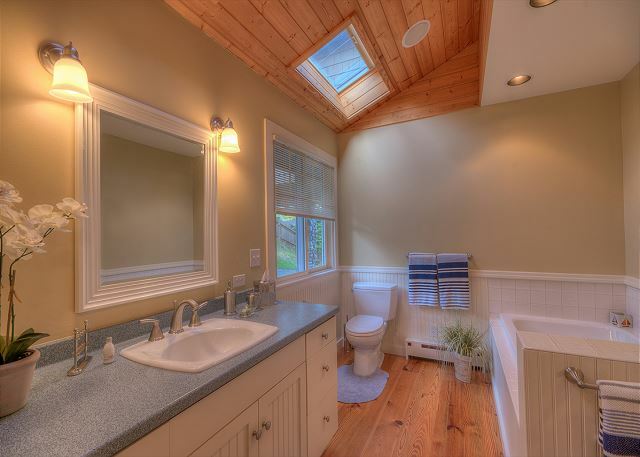 A beautiful bathroom with soaking tub. 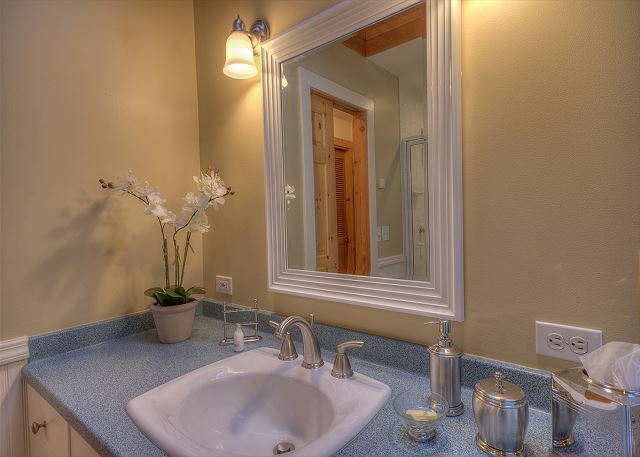 A close up view of the bathroom sink. A view of the soaking tub and shower stall. The lower level also has a room with two twin beds in it. A second view of the downstairs living room including lower exit door that walks out to the beach. A queen size bed in a lower floor bedroom. Just in case you got lost inside this dream house, here is one last picture of the perfect house on the perfect cove on the perfect island. 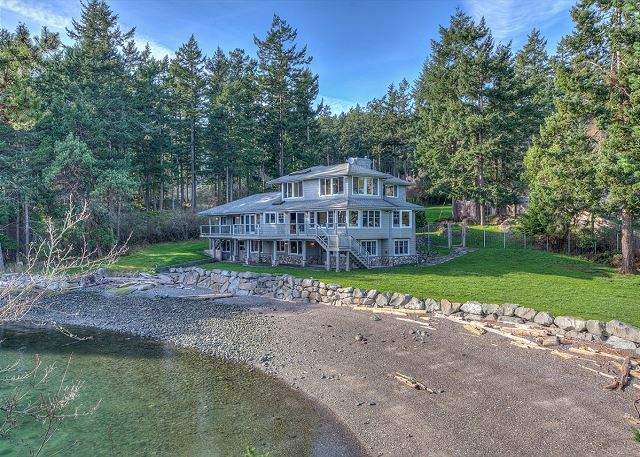 STUNNING WATERFRONT HOME WITH PRIVATE BEACH AND COVE! 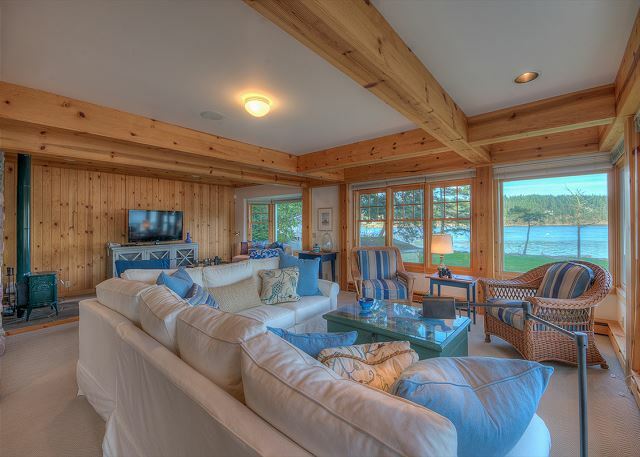 This home is unparalleled among vacation rentals. Nestled in a cove off of Obstruction Pass, one soon forgets there is a world outside this paradise. Located at the end of a small, Private community, you are certain to experience the serenity that the island has to offer. Cross the large, grassy yard to the point where a pair of Adirondack chairs await - the perfect place to catch the last sun rays of the day and let the world go by. 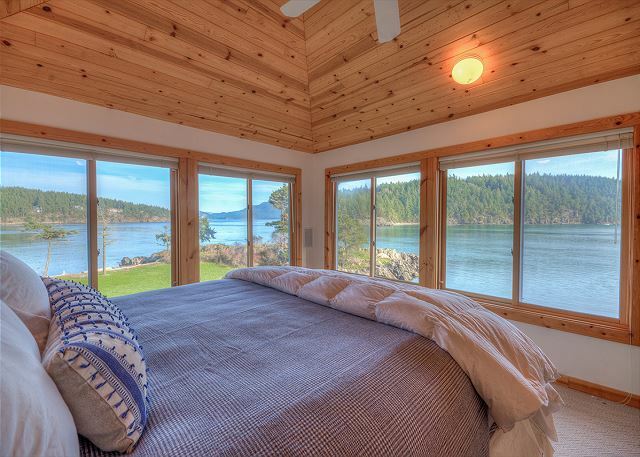 A harmonious blend of styles, this home incorporates Pacific Northwest wood elegance with the charm of a beach front bungalow. Flaunting a large array of windows, one would be hard pressed to miss the water views from the main areas of the house. A sizable deck, with tables and chairs, extends along the south side of the house from the main level, while the lower level offers a patio with shade cover for those warm summer afternoons. With four bedrooms and two kitchens, this home is perfect for either an extended family or multiple families. 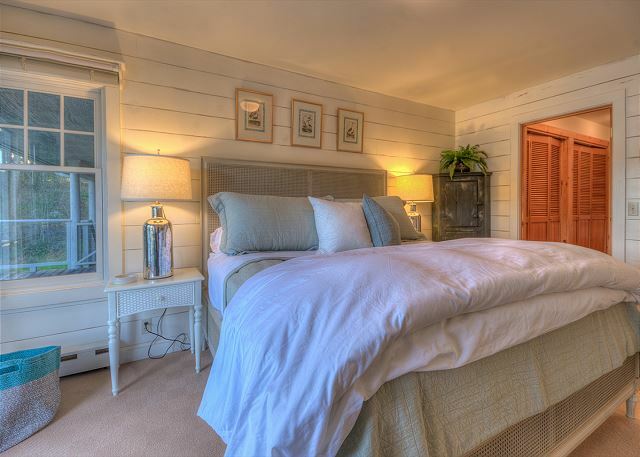 The master bedroom is located on the main floor of the house and sports an en-suite bathroom with soaking tub and shower. Upstairs, enjoy the comfort of a large suite a la California King and another well-decorated bedroom with a pair of twin beds. 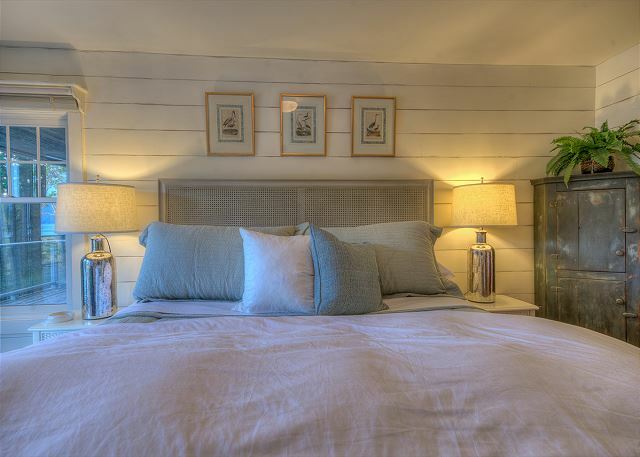 the lower level of the home is equipped with a second kitchen and sitting room, and sleeping accommodations consist of a queen bed and two more twin beds. The main floor is open yet cozy. 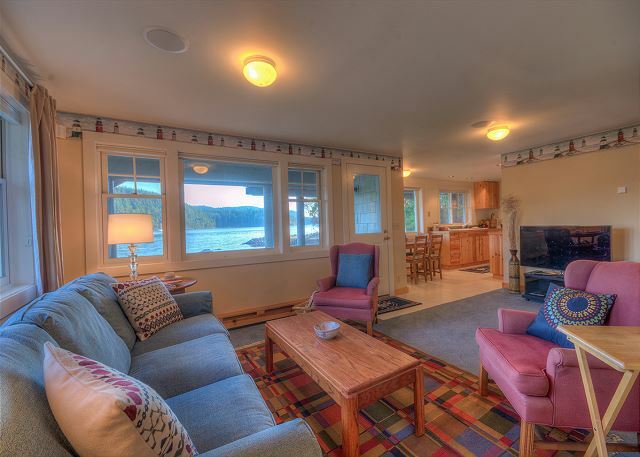 The living area offers a flat screen television, wood stove, and plenty of seating for all to enjoy both. 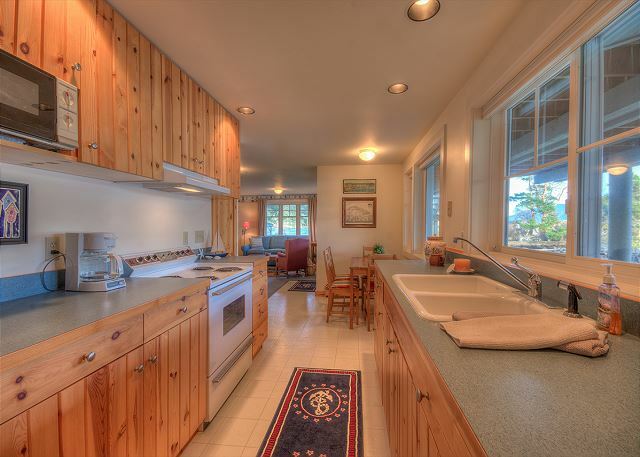 The kitchen is spacious and well stocked with a center island. A barbecue conveniently sits on the deck outside the sliding door. The lower level living area also houses a television, and its kitchen supplies all the essentials for the late night snack attacks. 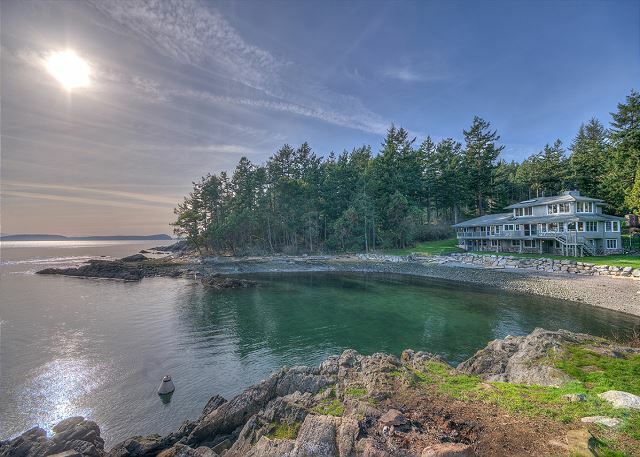 The private beach access and clandestine location makes this home one of the true gems of Orcas Island. Close to Doe Bay and Obstruction Pass State Park, the drive is about 35 minutes from the ferry landing and 20 minutes from Eastsound Village. Everything was wonderful with 2 exceptions. The stove & dishwasher. It’s time to update and replace them. Having 5 grandchildren from ages 6-1 we did a lot of cooking and clean up at the property. But, the house set up, location and beauty was amazing! We had a wonderful relaxing vacation. The house is amazing and so well equipped. There was lots of room to spread out and the location is spectacular. I have already recommended it to several friends. Lots to describe with this property for situational awareness. Here are the wonderful things about this property. We have traveled to several other luxury locations and the location and tranquility is tough to beat at this property. Definitely a pleasant place to stay. Here are our nick-picks concerning this property. Lots of spider webs around the eves; the deck has chunks out of it; dishwasher is on its last leg; some power outlets in the living room are INOP; too much kelp surrounding cove to fish without losing lures (4 lost); Internet is not conducive to telecommuting professionals; side yard gate is rotten; not enough garbage bags for both garbage & separating recycling; too rocky to dig for cove clams; no clam-digging shovels. Would have been nice to have kayaks or other water equipment on-site due to cost of on-island options or bringing them across on the ferry. We were very pleased with the rental-very private location, updated decor, plenty of room for everyone, clean, kitchen will equipped, amazing view from large deck off dining area, great views of ocean from all 5 bedrooms, very nice bedding. Sign-in and checkout information given online-very convenient. Close to the state park and near lake for swimming and kayaking. We already booked it again! 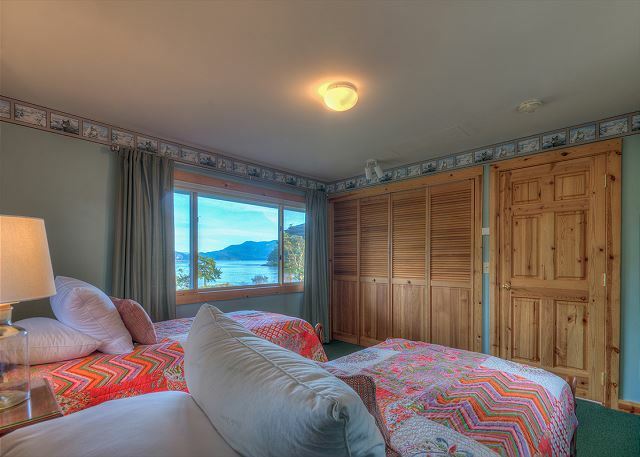 I almost hesitate to write this review because I want this place to be available whenever I'm planning a family trip to Orcas in the future. We've rented places all over the island in the past and this has become our new favorite, we booked it again before we even checked out! The tranquility of being on the water made for a very relaxing vacation, we loved watching the blue herons fish at low tide and the eagles cruising by. We even spied a pod of whales one day. The kids enjoyed flying kites and running around the spacious yard, as well as looking for crabs and whatever else the tide brought in. We observed the currents to be quite strong just off of the beach, something to keep in mind for safety, we watched several kayakers attempt to overcome them before just beaching their kayaks and carrying them. The home itself is in fine condition, seems at one time it might have been shared between multiple families because there are kitchens on both the lower and middle levels. All the beds were comfortable and the kitchens were functional albeit stocked with a lot of random implements that made searching for things a challenge at times. The home was a little light on larger cookware and things like spices and condiments that you sometimes find at other rentals, so keep that in mind if you’re traveling with a bigger group, it’s about a 25-minute drive back to the grocery store in Eastsound. I highly recommend stopping by the nearby Buck Bay shellfish farm, they are a little pricey but have an awesome selection of fresh fish and shellfish. Cell phone reception is pretty much nonexistent on this part of the island and the street sign faces a direction where you’re not going to see it when you first drive by, so make sure you map it out before you start driving to Olga. You want to pass the sailing club and then keep driving straight, the road will narrow and as long as you don’t turn you’ll end up in the driveway of this great rental! My family stayed here for 4 nights and it was absolute perfection. My only complaint is that I had to leave. The home itself was absolutely perfect for my family of 10. The pictures and description of this place do not do it justice. It is amazing. We sat on the deck and watched bald eagles fishing, deer grazing and serenity in the surrounding views. We kayaked right off our private beach. Played badminton on the lawn. Cooked family meals in the kitchen which is laid out nicely for group cooking. there is a spot just down the road to get fresh oysters which my family loved. I would definitely come back and next time stay much longer. The first night we baked Lasagna in the dirty oven that smoked up the common living area. My cleaning deposit should have covered that. It would have been nice to have some water toys on the premises to use, their a pain to bring in suitcases. Other than that the place was tranquil, beautiful, relaxing, and easy to spend a week at! We had great weather so every meal was taken out on the deck watching Mother Nature. This was a family reunion. Great house, lovely beach, wonderful weather. Thoroughly enjoyed by all. We had a wonderful time there. The house was beautiful and the area was so nice along with a really nice view. There was plenty of room for 3 families with bedrooms on all floors. The description was accurate on all accounts. I would highly recommend this house to others and would love to return next year. Home with a View - Serenity Now! This home is in an amazing location with awesome views from almost any room and especially the large back deck. Our family of 6 (parents and 4 adult children) found it very comfortable. Communication with home manager was very good and prompt. Getting in was easy and we felt secure with the gate and lockbox. Each of the beds we slept in were very comfortable and the home was very clean when we arrived. The kitchen was well stocked with dishes, flatware, pots, pans, utensils, etc. We cooked at the house almost every night because fresh food is readily available, especially seafood! We loved sitting out on the deck at the large table enjoying our dinner and wine while watching the sky change with the sunset. The house is a bit remote, but we loved that about it. The closest grocery store is about 20 minutes away in Eastsound. Hiking in Moran State Park was only about 10 minutes away and picking up fresh oysters and seafood only 5 minutes away at Buck Bay. We also went sailing and kayaking with Orcas Sailing and had an awesome time. The only minor negative is that the kitchen is a bit unorganized (most likely due to much use) and the outdoor grill needs to be replaced. I highly recommend this home for anyone wanting a wonderful get away! We hope to get back soon!! Our family group of 12 ranging from 6 months old to 70+ thoroughly enjoyed our 6 nights at the house on Obstruction Pass. It was spacious, nicely equipped and a nice private location for us to enjoy our time together. Beds were comfortable and the kitchen was fully stocked. 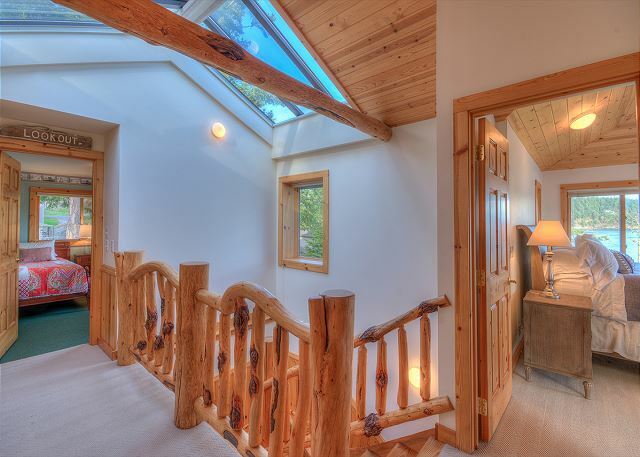 The master bedroom on the top level was spectacular. If there was a shortcoming, the lack of cell service, the very slow internet and the limited TV info were sources of temporary frustration, particularly for the teenagers in our group. A leak in the main floor master bathtub which had water pouring out of a light fixture in the laundry room was a lowlight of the stay. That said, time spent on the deck, at the water's edge, on a nearby boat rental, on hikes in Moran State Park and eating fresh oysters at nearby Buck Bay made for a memorable week. The house was beautifully furnished, a lot of fun extras, amazing views and a great kitchen. Clean and well-maintained! Received prompt feedback to questions! Would definitely recommend!!! The property had everything we needed and more room for fresbie, kayak right from the point lots of hiking and swimming at Moran state park,great cook outs on the deck.we would like to give J.R. and his staff at Windermere a speacial Thankyou for keeping are weeks vacation going even after a small problem occurred at our 1st rental, they got back to us and made sure everything was good again.We'll be back to Orcas island soon and renting a house so much family fun. Had the whole extended family for a long weekend here and everyone had a fabulous time. Kids did not want to leave. All 12 of us loved this place - plenty of room for all of us, beautifully furnished, high quality construction, and the view was lovely - always changing with the tides and always interesting. I would definitely recommend it for anyone who wants space for multiple families because it provided both privacy (with the three floors, and noise was minimal between floors) and great communal dining/visiting space when we were all together. A great time on Obstruction Pass! We had a terrific time at this house! 5 boys with 5 adults enjoyed every bit of the property, the house and Orcas Island! I would highly recommend and plan to come back!!! Location, location, location. Amazing views. Spacious. Well furnished. Tasteful. A great family vacation! Great place! Had everything we desired and more. Management was very helpful. The home was spacious and multiple living areas were great for larger group to have rooms to retreat to away from the hustle and bustle of the kitchen and main living area. The deck was spacious and useful and the views were spectacular. The house was just beautiful, very clean and open and roomy. And the views were even more amazing than the house! Easily slept 10! We all loved it and everyone had a great time. Great secluded, spacious home. Hard to find. When trying to find it, don't be tempted to turn right. Keep going straight until you run into the security gate. We stayed here for a family get together with 6 adults and 5 small kids. It was an amazing house that fit us all comfortably, and provided a beautiful setting for the kids to be outside all day, whether it was on the beach, climbing rocks, or running around on the large deck. The house had very nice furnishings inside, as well as lots of space and separate floors that provided privacy when needed. The house setting is private, and we were able to see lots of wildlife from the deck. The property management was also very quick with responses and any help when needed before and during our stay. We stayed 5 days and made tons of memories. We would love to come back here once the kids are a bit older so we can enjoy more of the island's hiking and other outdoor activities. Property was 90% as described. Great location. Nice setting with plenty of space and great deck. 2 issues cause for not five stars. The downstairs kitchen is a misnomer. Nothing works. Fridge and oven for show only. Not powered on. Had to jerry-rig the circa 1970 sears fridge to power up but the compressor was shot so spoiled about $100 in food, including cream filled birthday cake! Traveling with 30 year veteran Sears repairman and even he said these were antiques. When you have 10-12pp and they say there are two kitchens and two fridges you expect them to work for $6k. Also great neighborhood with friendly neighbors and lots of dogs. I'm VERY picky about my dog and his "business". The yard is not maintained. At all. Looks like all the neighborhood dogs use it as do the deer, rabbits Etc. Not a huge issue but they whole idea of cleaning up behind your dog is non-existent here. It is a spectacular setting on Orcas and would recommend for a large group. Company is good to work with and again home is very, very nice and comfortable. Stove upstairs is silly. Haven't seen this style stove in 10 years- Induction and they are the worst. BBQ was great. No waffle maker or way to make pancakes. Ie no griddle or griddle top. Again, not huge issues but for the money and sure number of people that it sleeps it would have been nice to use the five lb bag of bisquick!! Overall we had a great time so don't let the little things bother you. More for the owners to think about but when your sitting on the deck with a cold beverage and watching the ferry pass 100 yards away it doesnt get much better. A lovely home in a pristine location. It was ideal for our family. View from every room, our own private beach with shells to be found every day. Managers were helpful and responsive. Beautiful island, friendly people, whale watching, hiking, shopping, and plenty of good places to eat. Truly our best family vacation ever. The house is very nice, the view is spectacular and it is very quiet. The place is beautifully furnished, has fabulous sheets, and a small but adequate collection of games. However, if your cell phone provider is Sprint, you will not be able to get a signal until you drive all the way back into East-sound. They do have Wifi, but it is very slow. There were a few crazy things like a $300 cleaning fee, which is high but ok if it's a "just walk out the door" arrangement but it is not. You are required to take out the garbage, clean all the dishes and do the towel laundry. I didn't mind doing the chores but then the price should be lower. Also, they have the latest check in and earliest check out times of any house I have ever rented in the US and abroad. If you cross over the 10am check out, it is $100/hr there after. Some of these rules felt rigid and not what I expect when I spend that much for a vacation rental. All in all a pleasant stay.